We are a company specialising in the sale, purchase and rental of Moorings on the Island of Mallorca / Majorca and in other Mediterranean ports. Through our network of Yachting connections, the Financial Industry and Overseas Representations, we are in a strong position to answer any enquiries that may arise. 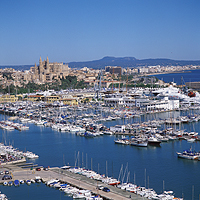 Our office in the Paseo Marítimo of Palma de Mallorca is managed by Idoia Herran, with assistance from others all of whom have had experience in the Mooring and Maritime business. Spanish, English and German are spoken and all methods of communications are available. We have private moorings all over the Island from 8 to 50 metres for sale and rental!! If at any time you need free information, prices, availability or just a discussion of market trends, please do not hesitate to contact us and we will be happy to assist. Our present mooring offer in Mallorca / Majorca please find with the harbour information provided.